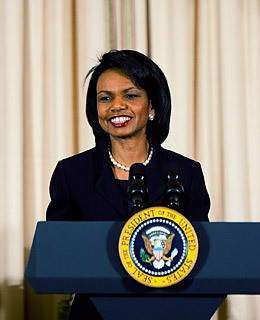 Speaking at the 2000 Republican National Convention, Condoleezza Rice said her father, a Presbyterian minister, was the Republican she admired most. "The Democrats in Jim Crow Alabama of 1952 would not register him to vote," she said. "The Republicans did." Nonetheless, voting in her first presidential election in 1976, the 27-year-old Rice was a registered Democrat and cast her ballot for Carter. By 1979, however, as a young professor, she was disappointed with what she saw as the President's soft treatment of the Soviet Union and his handling of the Iran hostage crisis. She voted for Reagan in 1980 and joined the GOP in 1984.